April Fool’s Day is day away, and with it, your annual chance to break social conventions and play dirty tricks. If you’re an Android device owner, there’s no better way to do it than with a handful of prank-oriented apps. In the mood to spook your friends this April Fool’s Day? Nachosware’s Ghost Prank app should be your first stop. 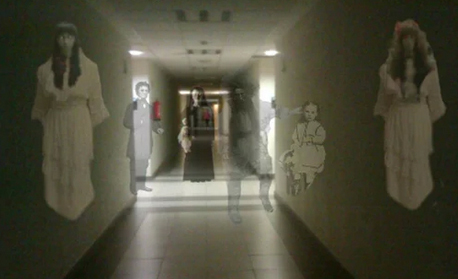 Take a photograph, then use the drag-and-drop interface to add ghosts to the image; even add sound effects. Share the image with your friends using popular services like Facebook, Twitter, Instagram and more. Remember scratch-n-sniff? The Taste and Smell app from DroidLabel takes the idea to a whole new level — sort of. 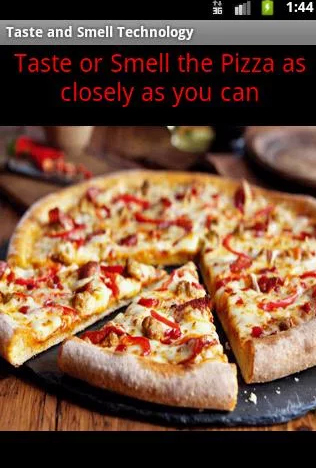 Pretending to use advanced technology that lets a user taste or smell a picture of food, the app actually emits a “fart” sound when their nose or tongue touches the screen. It’s like a whoopee cushion, with food! Your Android device gives you the power to see through your friends’ clothes — or so you’ll tell them. The Naked Scanner app puts a photo of a man or a woman in their underwear on your screen, and when you hold it up to your friend and tilt it this way and that, it looks like you’re seeing right through their clothes. It’s great for at least a few grown-up laughs. 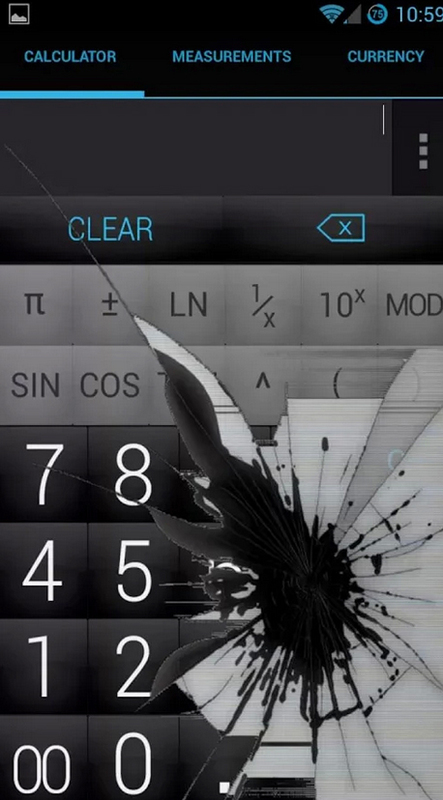 There’s nothing more fun on April Fool’s Day than making your friends feel bad about themselves, and the Best Cracked Screen Prank will do just that. Open the app and hand your phone to your friend, and let them try the “strength test.” When they press their thumb to your phone’s screen, it will “shatter” with a convincing graphic. Instant guilty friend! Love the idea of playing some April Fools pranks, but can’t quite think up any? 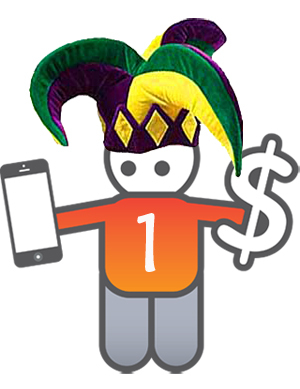 Check out April Fools Pranks from DaleAppStudios. 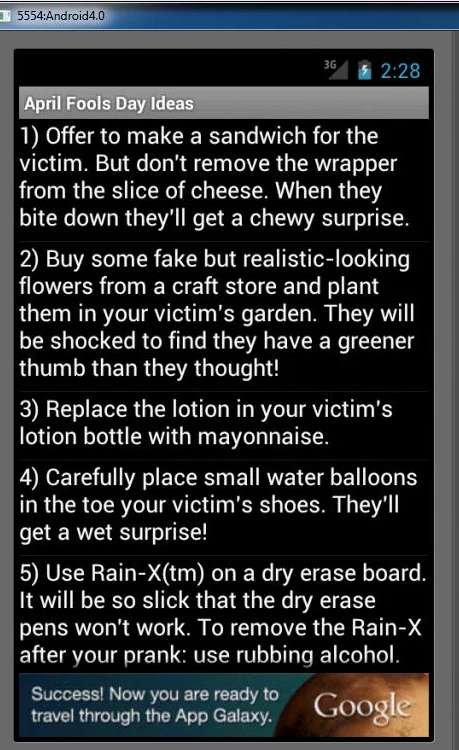 It’s a goldmine of prank ideas, almost 70 of them. While it’s not as feature-rich as some other apps — it’s basically a long text file — the ideas are priceless.